Pollard’s essay was written for the catalogue of William Andrews Clark Jr.’s collection, published in 1921 by John Henry Nash. Rather than a straight historical account of the two presses, Pollard offers a meditation on their influences and influence, particularly in matters of design and typography. 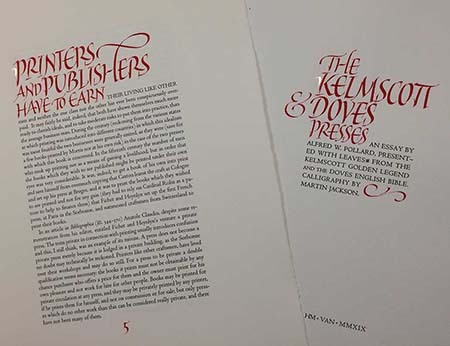 It is embellished here with calligraphy by Martin Jackson, and accompanied by a leaf from both of the presses: the Kelmscott's Golden Legend and the Doves' English Bible. 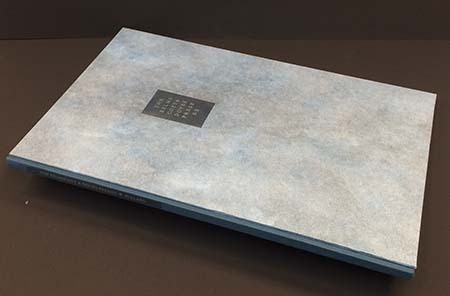 The book's size (10 x 15 inches) was dictated by the Bible leaf. The text is set in Centaur and Martin's calligraphy is printed, in red, from polymer plates. The Arches paper was dampened for printing. The edition is 55 copies: five (I-V) hors de commerce; 30 (21-50, the "Printed" issue) with Martin's calligraphy printed, in red, from polymer plates; and 20 (1-20, the "Written" issue) with all of the calligraphy actually written in by him, plus a gilded flourish on the title page and essay opening. The Printed copies (25 pp., issued at $750) were cased at HM in quarter cloth with painted paper over boards. 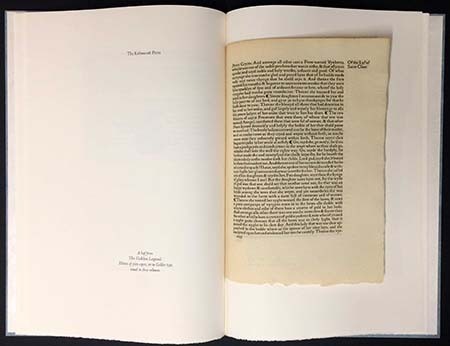 The Written copies were bound by Claudia Cohen: quarter vellum, sewn on tapes laced into boards covered with original paste papers that have been tooled in gilt, issued in a clamshell box.